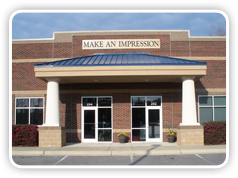 Backed by over 30 years of expertise, Make An Impression, Inc., is a family-owned-and-operated business serving the greater Raleigh, NC area. Quick turnaround time, competitive pricing, and our full-service capabilities ensure fast and accurate printing that meets your deadlines. With the latest in printing technology and unparalleled attention to detail, Make An Impression, Inc. provides full-service professional solutions for all your printing needs. We combine affordable pricing and the highest quality craftsmanship to produce visually stimulating materials for every budget. Our goal at Make An Impression is to be your One Stop Shop for printing and other services. Whether it's business cards and envelopes, posters, flyers and booklets, or shipping, faxing and fullfillment orders, we've got you covered with the best print solutions for your marketing dollar. With our extensive resources, we can either manage your next print marketing project or direct you to the best sources. Check out our multitude of products and services. For multiple reasons, February 1st 2019 will be the last day Make An Impression will have United Parcel Service (UPS) pick up services. As of February 4th, 2019 Make An Impression will no longer accept United Parcel Service (UPS) package drop offs.